Home » Skin lightening » Does Hydroquinone Cause Cancer? No matter how careful we are, we still end up exposing a bit to the sun during summer. But it’s not only the sun spots that you may worrying about, but also some blemishes, freckles, dark spots or age spots that make your skin not look at its best. From the natural home remedies, to the cosmetic products, the number of skin whitening solutions is quite impressive and you only need to gather some information before settling for one to try. Now that you care for the subject, you do realize that people talk a lot about something called “hydroquinone”. Popular and quite commonly used, hydroquinone is still bringing some controversial among the scientists out there. Even though it’s proved it’s able to whiten your skin, it’s also true that some believe it comes with plenty of side effects and risks. And to top all of that, the idea that hydroquinone is related to cancer isn’t a surprise at all. To make it clear right from beginning, even though there are many claiming that hydroquinone causes cancer, the FDA still allows its use in the US- in both OTC and prescription strength concentrations. In order to make a better image about hydroquinone- what it is, what are the risks and how is related to cancer, scroll down for getting all the information you need. Is cancer a side effect of using hydroquinone? Hydroquinone is a topical agent that lowers skin pigmentation. You may get it out of the counter in a concentration going up to 2% of hydroquinone, or get it under prescription, in which case it has a concentration of 4% and more. People take hydroquinone to lighten skin affected by hyperpigmentation, melasma, age spots and freckles too. Ever since 1982, the National Toxicology Program (NTP) talked about a rule that recommended that all OTC skin products containing up to 2% hydroquinone to be recognized as efficient and safe for use. Due to some evidence that hydroquinone may act as a carcinogen in mice, after oral administration, this rule was in fact withdrawn in 2006. Hydroquinone is also related to ochronosis, a medical skin condition that leads to darkening of skin and even disfiguration, in case of topical applications. Back in 2006, the NTP recommended that more studies should be developed in order to see it there is risk for humans when using hydroquinone. More and more studies have been conducted ever since 2009 to find more information about the link between hydroquinone and cancer. But, meanwhile, NTP thinks that hydroquinone may remain at reach as an OTC skin whitening product. When it comes to hydroquinone, there are some common concerns related to it so let’s take a closer look at them. It’s the British Cancer Journal that published a study that presented the connection between a very high dose of hydroquinone and cancer, in mice. There was also a second study on the matter, but it came to the same conclusion. RELATED POST: Does Ambi Fade Cream Lighten Skin? Additionally, hydroquinone was forbidden in Europe, Australia and some countries in Africa and Asia. Even though the studies on mice and the link to cancer do make us wonder, until this day there are no studies proving that hydroquinone causes cancer in humans in the same way. As hydroquinone does make the skin more vulnerable to UV rays, it may be that it’s in fact connected to higher skin cancer risk. This brings us to an important rule to remind when using hydroquinone: always use a broad spectrum SPF 50 sunscreen when applying a skincare product containing hydroquinone. It seems that hydroquinone causes a medical condition named “ochronosis”, which makes the skin present a dark blue and even black hue. This isn’t a common issue, especially when using an OTC concentration, but there have been cases of people developing a dark blue and black skin discoloration after using hydroquinone products. Ochronosis may also lead to grayish-brown spots and small yellow and brown bumps, which translate in fact as skin thickening. This type of skin condition happens a lot more to dark-skinned individuals that use high concentration of hydroquinone for a long time. Most dermatologists in the US have never treated a patient with ochronosis because of use of hydroquinone. One thing is sure: ochronosis has been noted to appear only in dark-skinned patients, for unknown reasons so far. Not only hydroquinone may be related to cancer, but it’s also proved to damage various human functions and systems. The immune system is one and hydroquinone has proved immunity weakening side effects in a number of the animal testing that have been done so far. Animal testing has shown that hydroquinone has an impressive impact on the endocrine system, which only means it may also have an effect on the human endocrine system. The problem doesn’t stop here as neurotoxin, that influences nervous system and lungs, is also noticed. As hydroquinone whitens the skin by inhibiting the production of melanin, it also prevents the skin from discoloring. This means it also lightens already-darkened areas on the skin such as melasma, discoloration and liver spots. The mechanism that controls the melanin production also allows UV light go into the skin a lot deeper. This only means that UV exposure becomes more carcinogenic, as it raises the depth at which the skin soaks up the DNA-damaging rays. This is why you need to wear sunscreen when using hydroquinone. You may also protect yourself better by using hydroquinone only in the evening, when the risk of UV exposure is gone. It seems that hydroquinone may cause irritation and skin redness, which may also lead to larger patches of irregular pigmentation in dark-skinned persons. Due to this risk for skin irritation, doctors insist on how you should never use hydroquinone on dry, chapped, inflamed or already sunburned skin. Hydroquinone works because it inhibits the enzyme tyrosinase, which is essential for the production of melanin in skin. As long as you continue to use hydroquinone, you will also control tyrosinase and pigment production. Once you stop to use it though, your skin’s natural supply of tyrosinase isn’t going to be controlled anymore. It’s only a matter of time until your skin gets back to its natural pigmentation. RELATED POST: Does African Black Soap Lighten Skin? You should only use hydroquinone in 2-4 month cycles and it’s best to use milder tyrosinase inhibitors in between. Azelaic acid, kojic acid, arbutin and other lightening agents are always a great choice. Don’t use skincare products that contain benzoyl peroxide while you’re under hydroquinone treatment. The combination of the two may cause a temporary staining of your skin. Some water and soap may help with removing the stain, but you can play it safe by simply not using anything containing benzoyl peroxide at the same time with hydroquinone products. Stay away from products containing resorcinol while using hydroquinone too. The risk for ochronosis is higher for dark-skinned people when using resorcinol products and hydroquinone at the same time. This is why you should stay safe and simple not combine the two types of products. Better yet, don’t use other skin lightening treatment when using hydroquinone. Always keep hydroquinone away from the eye area at all costs as hydroquinone may cause pigmentation of the eye and permanent corneal damage if your eye is directly exposed to hydroquinone. 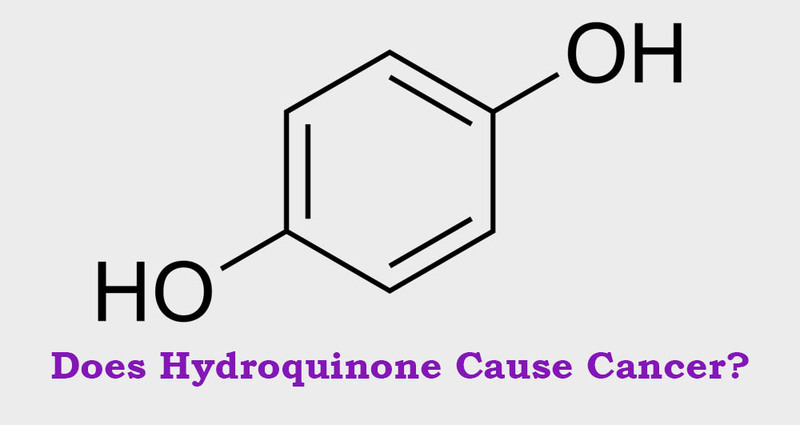 Even though hydroquinone raises some concerns, the most important outcome so far has shown that hydroquinone isn’t related to cancer in humans, but only mice. The people got scared due to a miss representation of a study some years ago. The study has shown a link between mice exposed to hydroquinone and their development of liver tumors. The situation in the study has been better described later, in 2006. It seems that very high doses of hydroquinone given by feeding tube presented the possibility to cause cancer, according to FDA. Nevertheless, no carcinogenic properties have to linked to topical or oral hydroquinone use in humans, so far. Therefore, one may use the standard preparation and safely take hydroquinone. It’s also quite obvious that hydroquinone is safer than many may think. Some imply that any concentration higher than 4% of hydroquinone presents risks, and yet, no study has showed so far that hydroquinone leads to cancer in humans when used topically. Truth be told, hydroquinone does raise valid worries, but it still holds its status as the most effective skin lightener on the market today. Yes, there are other ingredients that also lighten your skin (vitamin C, Retin A, retinol and alpha hydroxy acids). You may very well use a concentration for 2% and add some more complementary ingredients for obvious results. Keep in mind to always get a low concentration of hydroquinone and OTC 2% products are quite efficient too. Try to buy products that contain hydroquinone only if they’re made in the US. Mercury is forbidden for years now as it causes many health problems and it’s found in many hydroquinone products made in other countries.